For truly authentic Indian - Pakistani meal experience, Tikka Palace, in the coastal town of Hermanus, offers guests a gastronomic adventure that is all things Indian. One’s senses will be ignited with the colours, smells and tastes that await guests. The Palace’s vibrant, rich colour scheme of reds, oranges, deep browns and golden yellows along with the tinkering of Indian music and the smell of spices creates a sense of warmth and authenticity. Dishes are served in Indian style copper bowls and diners can expect an array of traditional extras in the form of side dishes and drinks. The menu is extensive and reflective of the best Indian Pakistani dishes. Most of the ingredients are imported to ensure authenticity. The chefs are Indian and Pakistani nationals and food is cooked in the traditional manner using Tandoori ovens. To start, try the samoosas or parathas. Mains deliver a variety of Briyanis, curries and Kormas and are served with sambals, home- made pickles and basmati rice. There are also some interesting Indian desserts on offer. The gold dusted Chocolate cake is a must try. 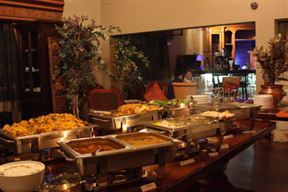 Tikka Palace also has a buffet service for parties of 12 or more. Tikka Palace is 3.7km from the centre of Hermanus , the nearest airport 83.7km (Cape Town International Airport).